Come join the conversation! 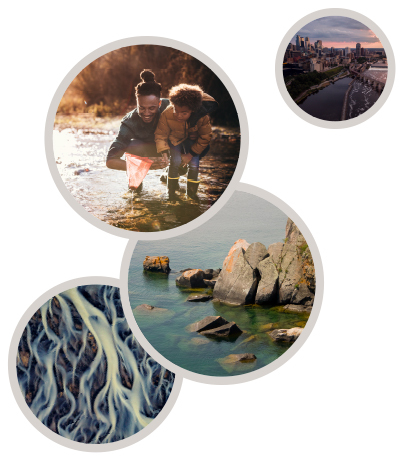 The Institute on the Environment’s new Second Monday series brings together a panel of experts – from within the University and beyond – to ask big questions, discuss collaborative projects, and dive into other cross-cutting sustainability issues. 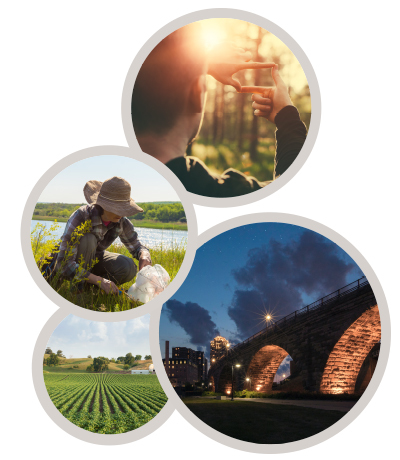 This spring, we’ll focus on topics related to our Institute-wide Impact Goals: accelerating the transition to a carbon-neutral Minnesota; defining realistic alternative sustainable land use for the state; and ensuring safe drinking water for all Minnesotans. Interested? Second Mondays are free and open to all — tickets are available through Eventbrite. Doors open at 3:15 p.m. Conversation from 3:45 – 4:45 p.m. Mingling to follow. Can’t make it in person? Join in on our YouTube channel. The growth of solar is not only a shift in how we produce energy – it also has significant land use implications. How might we make it both an economic and an ecological win? 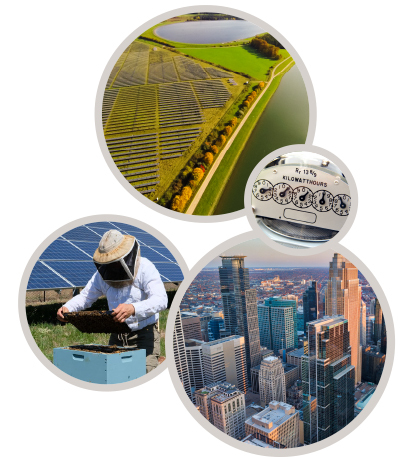 Join a panel of Minnesota-based experts for a lively conversation about wide-ranging opportunities to maximize the benefits of solar farms, from providing pollinator habitat to improving soil and water quality. Learn why this innovation is vital for Minnesota’s clean-energy future, what’s already happening, and about the opportunities ahead. The conversation will feature Rob Davis of Fresh Energy, Brian Burandt of Connexus Energy, and Dr. Dave Mulla of the College of Food, Agricultural, and Natural Resource Sciences. Our moderator is Ellen Anderson, director of IonE’s Energy Transition Lab and leader of its carbon-neutral Minnesota Impact Goal. Special guests Milk & Honey Ciders, of St. Joseph Minnesota, will also be with us sampling their limited-edition Solar Sweet Farm Cider (21+ only, quantities are limited). From the beloved monarch to the rusty-patched bumblebee, the plight of pollinators has become well known to the public. In August 2016, Minnesota Governor Mark Dayton signed an executive order creating a state-wide team dedicated to restoring healthy pollinator levels in the state. And at the national level, the U.S. Fish and Wildlife Service is currently considering listing the monarch butterfly as an endangered species. What could actions like this mean for farmers who find milkweed – a host plant of the monarch – in their croplands? How do we create landscapes that are compatible for people and pollinators? Join a panel of Minnesota-based experts for conversation about addressing species conservation in working lands; incorporating pollinator conservation goals in farming and along roadsides; and the tradeoffs we face in trying to use land for people’s livelihoods and species conservation at the same time. The conversation will feature Alison Cariveau, science coordinator of the Monarch Joint Venture, Dan Cariveau, assistant professor at the University of Minnesota’s Bee Research Facility, Christopher Smith of the Minnesota Department of Transportation, and Minnesota State Representative Jean Wagenius. Our moderator is Eric Lonsdorf, program director of IonE’s Natural Capital Project and leader of its Impact Goal focused on sustainable land use. More than 75 percent of Minnesotans drink groundwater – which means they also drink what we put onto our land. Some contaminants and bacteria can be removed through water treatment, but it’s often cheaper and safer to keep out unwanted elements in the first place. All of this means keeping drinking water clean for all Minnesotans will require thinking creatively and most likely changing land management in the places closest to wells. But how do we choose where to protect, what to do, and how to pay for it? How could Minnesota lead the way for other states looking to ensure safe drinking water? Join us for our third and final Second Monday of the spring season, where a panel of Minnesota-based experts will dig into these questions from a range of perspectives. The conversation will feature Tannie Eshenaur of the Minnesota Department of Health, Jacob Jungers, assistant professor in the Department of Agronomy and Plant Genetics (CFANS), and Emily Vikre of Duluth-based Vikre Distillery. Our moderator is Kate Brauman, director of IonE’s Global Water Initiative and leader of IonE’s Impact Goal focused on ensuring safe drinking water for all Minnesotans.